Artist Martin Howse will introduce participants to the field of psychogeophysics and take participants through a range of guided, electrochemical experimental activities. 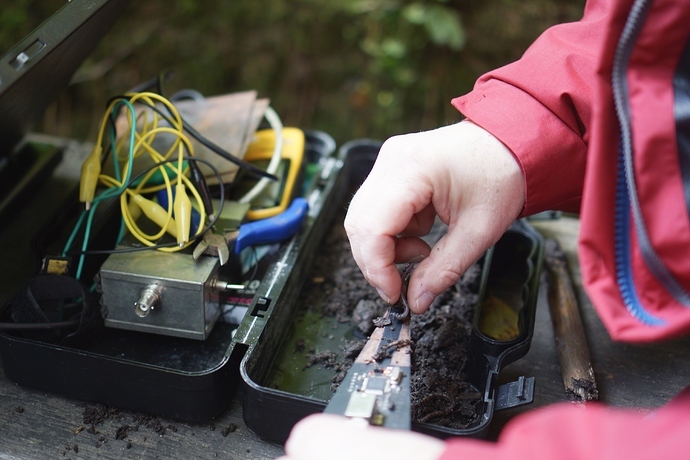 This three day Earth Coding workshop, organised by Derek Hales for hackerspace Bridge Rectifier actively explores links between contemporary technology and the earth. This event is a fundraiser for Bridge Rectifier a new hackerspace in Hebden Bridge, West Yorkshire. This event has a limited number of places free to current members of Bridge Rectifier hackerspace and members of hackerspaces in Leeds and Manchester. We are happy to discuss pay What You can Afford arrangements with individuals. Introduction and Black Death Synthesiser/Dark Interpreter Open Hardware. 7pm Friday 9th October @ Bridge Rectifier, Hebble End Works, Hebden Bridge. Martin will give a performance of earthvoice at 9pm on Saturday evening at 20.30 at The Birchcliffe Centre. The session in the afternoon will be in Nutclough wood and on Midgley moor so please think about the outdoors…and what to wear. Recording devices, paper, pens, audio recorders, cameras, headphones. battery powered portable speakers if you have them. Lunch: we won’t be providing food – but we will have tea and coffee. Suitable clothing for (indoor and) outdoor workshop. Ticket details for the up-coming Earth Coding workshop with artist Martin Howse, now available here.